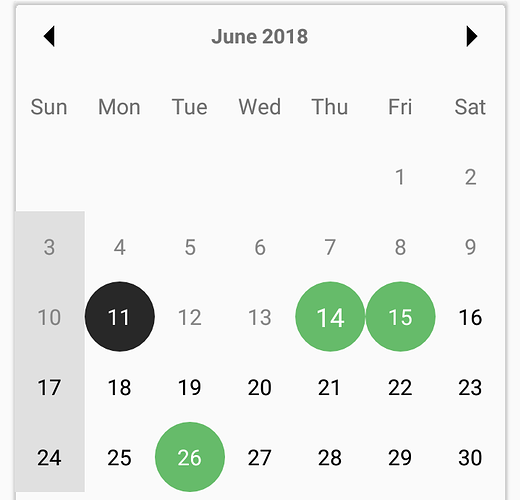 I want to set multiple date color in calendar view. Not able set event colors. How to do? Unable to set event colors in calendar view. и в androide и iphone календарь одинаково заработал. I want to set a background color of a date. The whole circle color will be filled not only the date text color. Like when we press to a particular date and by default its background color changes to yellow and text color white. I want to achieve like this. Different color for different dates. Let from 04-06-2019, 15-06-2019 and 26-04-2019 will be green, 11-06-2019 will be black. Like this other date colors need to be decorated. How can I achieve the above things in framework 7. Any reference or resolution ? But I don’t want to add range days. I want to add different days. Like I don’t want to decorate from 17-04-2019 to 25-04-2019. I want 17th, 19th, 20th, 24th etc. Thanks. Can you provide me the css class to make the days circle and colorful.